Where fun, happiness and imagination come to sleep over! Teepee Dreams sleepover parties deliver the most magical and unforgettable experience for your child and their guests. 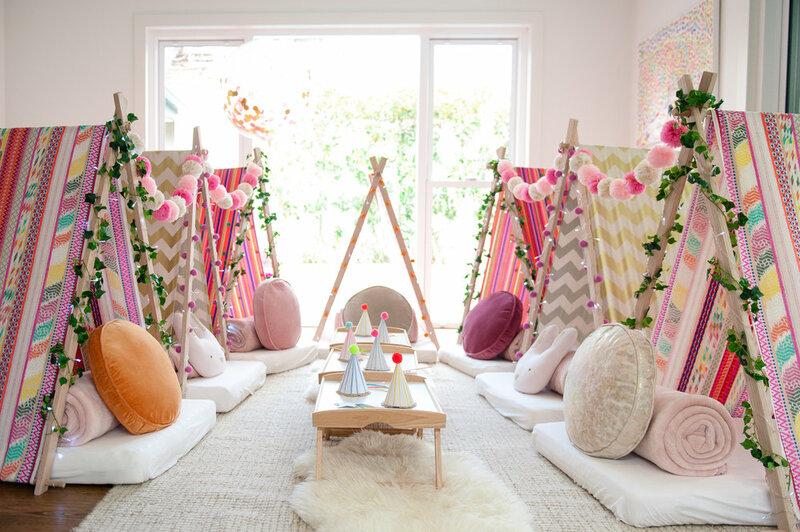 Slumber parties form some of the happiest memories from our childhood and it’s the little touches we include that make our Teepee Dreams parties an extraordinary experience! We stop at nothing to create the perfect party for you to host. Simply choose from one of our gorgeous themes and our team will take care of the rest! From set up and styling to party add-ons (sleep masks, spa kits and lolly bars), our goal is to make hosting a party in your home simple! We cater for boys and girls sleepover parties. Our party theme packages are available for hire throughout Bayside and surrounding Melbourne suburbs. Watch your home transform into an enchanting party space! "Happiness lies within the details of a party that creates a sense of imagination and adventure"
Whether you are bringing your child and their friends together to celebrate on a balmy summer evening or cosying up during a wintery sparkly night, you’ll see the beauty and magic revealed in our Teepee Dreams detail. The centrepiece of your party will be our kids teepees, together with our plush and luxurious blankets, cushions and mattresses to provide the ultimate comfortable slumber. The teepees are styled with bunting, fairy lights, floor rugs, tray table and a lantern. If you are planning a whimsical birthday or an adventure packed party, we offer the perfect slumber party packages to suit your child from ages 6 through to 15. Simply choose your own slumber party adventure from one of our packages below. Our standard hire package is for 5 teepees for $300.00. Additional teepees are $50 each, ( for10 or more teepees please contact us for pricing). If you require less teepees, also please get in touch and we can provide pricing. Payment terms are $100 to secure the booking and full payment required 14 days prior to the party date. Don’t forget to check out our great add-ons for any of our themes. We have a great collection of trusted suppliers to help us bring your child’s party together. *Let us know if you are interested in any add-ons at your time of booking and we'll provide the cost. We are Anna and Danielle, two Melbourne mums and the creators behind Teepee Dreams. As working mums ourselves, we understand the effort involved in hosting a party at home. We’re here to help make the sleepover request an easy one! Let us enchant you by creating the most memorable event for your child’s next birthday party, sleepover or special play date! Make your party planning hassle free by getting in touch with us to organise it all for you! Send us a message by filling in our online enquiry form below, emailing or calling us! Thanks for your message. We'll be back in touch with you soon. If you send us a message via our online enquiry form and you don’t hear back from us, please check your email junk folder as sometimes it gets redirected there. Thanks!